For dinner parties at his stunning apartment, Surajit Bomti Iyengar serves pantras (fried stuffed crêpes) as an appetizer. They're well worth the effort of making crêpes (which are surprisingly easy to prepare once you get the hang of it). Coating the crêpes with egg and bread crumbs makes them fantastically crispy when fried. Pairing: Vibrant Prosecco: NV Riondo Pink Spago Raboso. Pairing: Spicy, cherry-scented Tuscan red blend: 2008 Tenuta di Ghizzano Il Ghizzano. Influenced by his Turkish-American wife, Meltem, Scott Conant spices up his silky potato soup with Turkish red-pepper paste (biber salcasi), made from sweet and hot peppers. Look for the paste at Middle Eastern groceries, or use harissa instead. Pairing: Silky white blend: 2009 Heartland Stickleback White. 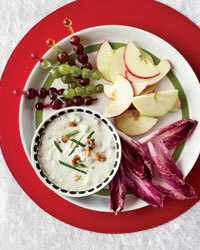 With walnuts, mayonnaise, apples and grapes, this recipe is a riff on classic Waldorf salad. Pairing: Dry, appley sparkling wine: NV Domaine Ste. Michelle Brut. 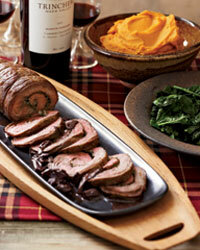 Mario Monticelli, the winemaker for Trinchero Napa Valley, learned to make this stuffed steak from his mother. Pairing: Velvety Napa Valley Merlot: 2007 Trinchero Napa Valley Mario's Vineyard.